Photography of Wildlife & Natural Areas of Newfoundland, Blue Jay (Cyanocitta cristata). 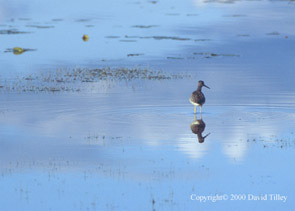 This peaceful setting betrays the true nature of this feisty stilted shorebird. Holding the job of warden to its aquatic habitat, It heckles intruders with loud abrasive alarm calls and swoops low to feign attack. No pond should be without one.